By taking a closer look at animal bones scattered across the wilderness landscape, a researcher at the University of Chicago has found a powerful tool for showing how species' populations have changed over decades or even a century. "The skeletons of long-dead animals lying on landscapes provide critical insight into our understanding of ecosystem history, especially how populations have changed," said the study's author, University of Chicago alumnus Joshua H. Miller, S.M. '05, PhD'09, a postdoctoral research fellow in biological sciences at Wright State University in Dayton, Ohio. The study, published in the March 28 issue of PLoS ONE, presents data that Miller collected for his UChicago doctoral dissertation. His study provides a deeper context for the many disturbances that are altering ecosystems around the world, including global warming, overharvesting and habitat destruction. "These changes result in population reductions and extinctions of some species, while others expand and invade new habitats and regions," Miller explained. "Most ecosystems have not been studied over long time spans  many decades at least  which hampers the ability of wildlife managers and other scientists to properly document or mediate these dramatic ecological changes." 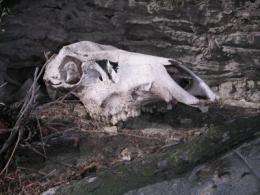 In research funded by the National Science Foundation, Miller surveyed bones from the skeletons of hoofed mammals (ungulates) in Yellowstone National Park. The bones ranged in age from newly dead to approximately 200 years old. Then he compared the numbers of specimens from each species documented in bones to surveys of the living populations. Miller found that all the native species in the living community were recovered and that the order of species from most abundant to least abundant was similar for the bones and the living community. Species whose populations significantly diminished or expanded over the last 20 to 80 years were predictably over- or under-represented in the bones relative to the living community. 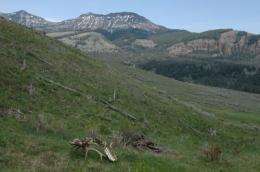 "Live elk were much more abundant in the 1990s than they are today," Miller said, "and the bones of Yellowstone feature far more elk than one would predict based on the current Yellowstone community." Horses, which were replaced by cars as the dominant mode of transportation in Yellowstone in the early 1900s, also are readily found as skeletal remains. Radiocarbon dating confirmed that horse bones were generally remnants from when the cavalry controlled Yellowstone in the late 1800s to early 1900s. In contrast to these ghosts of larger past populations, species that have recently increased in abundance (bison and the recently arrived mountain goat) are less common in the skeletal record than current living populations would predict. Overall, the bones of Yellowstone correlate well with the area's historical ecosystem and provide more detailed information about the historical community than can be acquired from only studying the ecosystem today. "Bones provide a great tool for uncovering historical ecological data that allow us to put modern biodiversity in a broader temporal context," Miller said. "The living populations of Yellowstone have been studied for a long time and provide a great opportunity to test how well bones record species' histories. Now we can go the next step and use bone accumulations in regions we have only recently begun studying to obtain critical historical data and establish how ecosystems have changed over the last decades, century or even longer." Miller's research also suggests that the ecological information contained in the fossil record may provide more biological details on extinct ecosystems than previously thought. "Josh has shown that the bones of Yellowstone accurately track recent and not-so-recent history of the large mammal populations in this famous North American ecosystem," said Kay Behrensmeyer, curator of vertebrate paleontology of the Smithsonian Institution's National Museum of Natural History. "This should be a wake-up call for ecologists interested in the movements, increases and declines of large mammal populations anywhere  bones are a relatively untapped and valuable source of ecological data about animals when they were alive." ecological information contained in the fossil record may provide more biological details on extinct ecosystems than previously thought. There's a small problem with this thought in that the bone distribution for modern animals differs radically from the bone distributions for fossils. Fossils exist predominantly because of rapid burial during catastrophic environmental conditions which is very different from finding bones currently just lying around on hillsides and valleys. I do hope the researchers take this into account before making the extension of the theory from modern conditions to ancient fossil environments. No. Catastrophic conditions are not needed. Rapid burial is only needed for complete skeletons. Lots of dead bodies have been washed down rivers and then buried. Drowning and burial under mud can happen even in good conditions. Catastrophes just allow a better chance at really good fossils. I do hope the researchers take this into account before making the extension of the theory from modern conditions to ancient fossil environments. I am sure they understand it much better than you do. Since you think the catastrophe was very recent Flood that never actually occurred. Just when do you think that Flood occurred Kevin?